29 leaves ; 30 cm. 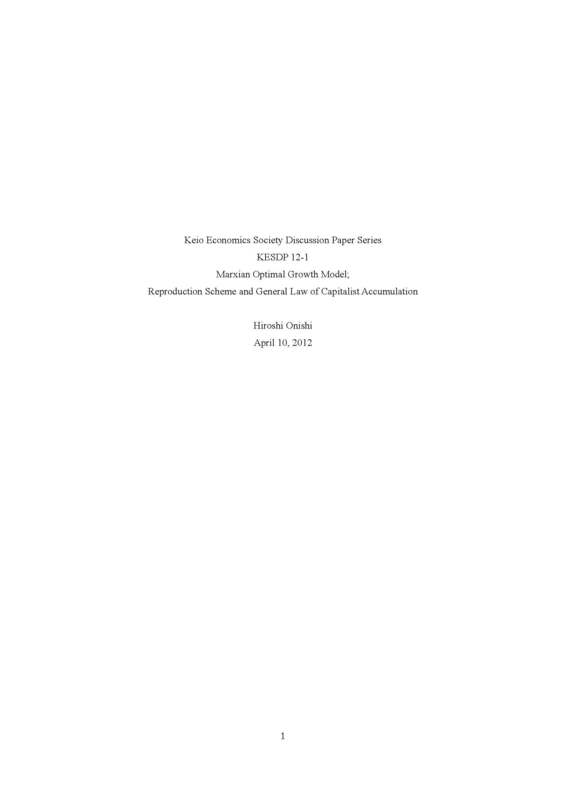 As Prof. Okishio proved the existence of exploitation mathematically, the birth, growth, and death of capitalism should also be proved mathematically,and for this purpose we formulated the so-called Marxian optimal growth model. This is not a model in value-term because peoples' direct interest is not value itself but utility and firms' interest is not value but profit. However, a very important finding of this paper is that such a non-value-term model can be translated into a value-term model, and we introduce a value-term reproduction scheme from the Marxian optimal growth model. In this form, we confirm that our model fulfills the conditions of simple reproduction and extended reproduction. However, a more important fact we found is that this optimal path shows (1) rising organic composition of capital, (2) falling rate of profit, and (3) falling ratio of the output of the first sector. The second fact contradicts the Okishio Theorem, and the third contradicts the Lenin.